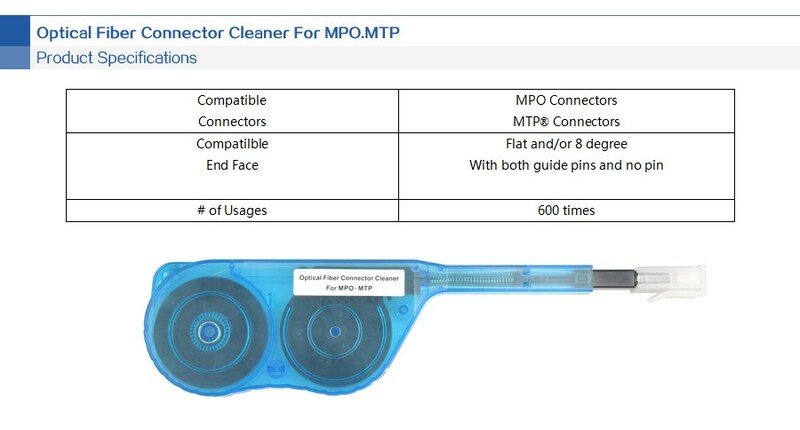 The MPO Cleaner is a high-performance device designed for cleaning the ferrule end-faces of MPO & MTP connectors. Cost effective tool for cleaning fiber end-faces without the use of alcohol .It saves time by effectively cleaning all 12 fibers at once. The MPO connector cleaner is designed to clean both exposed jumper ends and connectors in adapters. 1,Effective on a variety of contaminates including dust and oils. 3,Capable of cleaning ferrules with or without guide pins. 4,Capable of cleaning MPO ferrules inside or outside an MPO adapter. 5,Narrow design reaches tightly spaced MPO adapters. 1,Clean multimode and single-mode(angled) MPO connectors. 2,Clean MPO connectors in adapter. 4,Great addition to cleaning kits.